Thankfully, the Corgi is an easily kept breed, and there is relatively little preparation that must be made before showing them. The first step in grooming a Corgi to make him look good on the outside, depends upon what you put in his insides! If you have a Corgi that is difficult to keep in coat, having already ruled out physical problems, you may need to address what you are feeding him. 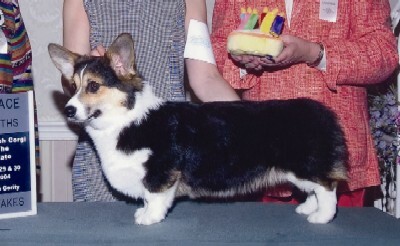 A Corgi can be expected to blow his coat (by this I mean drop his undercoat) seasonally, usually heaviest in the Spring. If your dog is dropping coat more often than this, then you may not be feeding him a good enough quality food. Find a "specialty" quality food that you like and can afford, and stick to it. Do not change foods too often - cats get finicky, dogs don't. You can feed the same food everyday for his entire life, and he will just keep on eating! If your dog does blow his coat, and you've already got him entered, please, comb all the dead hair out before you show him! If you leave the dead undercoat in, trying to fool the judge that he is not really out of coat, all you are truly saying is that you don't think the judge is smart enough to recognize a dog that is temporarily out of coat. Our standard specifically states that a dog that is out of coat is not to be penalized, as long as the remaining coat looks healthy. On the other hand, if he has blown so much coat that he looks like something the cat dragged in and didn't want, then it would be wise to pull him and forfeit the entry money. The quicker you get that dead hair out of there, the faster it can grow back! Other areas to be addressed before even sending in your entry include care of the two T's: teeth and toenails. Toenails should be routinely inspected and cut. It is best to try and get on a regular schedule of cutting toenails once a week. Again, our standard specifically states that toenails are to be short. Routine tooth care is also of extreme importance. There are many doggie toothpastes on the market, and you may use a toothbrush, or even a washcloth to apply the toothpaste. Human toothpaste is NOT recommended, as there is really no way for your dog to rinse his mouth out, and you know how much you hate to swallow any toothpaste, so you know your dog won't want to do it either. The doggie toothpaste requires no rinsing, and they actually come to enjoy the routine. Tooth care is important, for some dogs, as some people, have a tendency toward gum disease which opens them up to infections that can seriously spread throughout the body as they get older. Preventative measures are always better than a huge vet bill later. If you are actively showing a dog, it is also a good idea to get into the habit of combing him out daily. This will help stimulate hair growth and will keep you on top of any skin or flea problems before they can become a problem. The "implements" that you will need to keep your dog in tip top shape include combs: coarse, medium, fine, and extra fine (flea comb). The coarse and medium comb can often be combined into one, as a greyhound type comb, with coarse on one end and medium on the other. I prefer a comb with a handle, as it is easier for those of us with arthritis to manipulate. The fine comb is not a flea comb, but is listed as "fine" - it is easiest to find as teflon coated. The extra fine comb is a flea comb. I rarely use a brush, but when I do, I prefer a bristle brush to a slicker or a pinbrush. About the only use I can find for a slicker is to comb the hair up on the hocks - but more of that later. In bristle brushes, I use a "porcupine" brush, one that has stiff white bristles surrounded by softer black bristles. The slicker brushes rip out too much healthy coat, and the pin brushes separate the coat and leave a "just raked" appearance to the topcoat. Other essential items include a good pair of scissors to tidy up the feet, or if you are handy, you may use an electric trimmer. A hair dryer is another excellent item to have. The one I like the best is the "Superduck" dryer, as it can double as either a hand-held unit or it has a table top stand that frees your hands up to comb the coat. Plus, the price is quite reasonable. If you like to spend money, another handy item to have is the Metro Air Force Dryer, which uses no heat, but blows out air like a leaf blower! This dryer is also great at blowing stray hairballs out the kennel door! Care must be take with the Air Force Dryer, as you can wind up with a very fluffy appearing dog. Remember to blow the coat with the direction of the hair growth, not against it. After all, the standard does say that the Corgi's coat should lie flat against the body, not stick out straight from it! While you are investing in "big ticket" grooming items, another handy dandy tool is the nail grinder. Oster has one out that has two speeds, but a lot of folks are using the Dremel rechargeable grinder. The rechargeable has the extra attraction of not needing electricity if you are at an outdoor show site. (As long as you remember to keep it charged!) When using a nail grinder you should wear protective eyewear so as not to catch anything unwanted in your eyes. Of the other nail trimmers, I far prefer the guillotine type such as the Resco nail trimmer with replaceable blades to the scissor type. Now that we are pretty well set with our hardware, let's see what else we need. Some other items you want for your tack box include a good quality shampoo, one that will get the dirt out, but leave some shine to the coat. When the dog is out of coat, you may want to use one of the texturizing shampoos, such as Cindra's Texture Shampoo. You will also need some of the non-rinsing shampoo, which is purple in color. You might want to experiment with Show-Sheen, a horse product that is sprayed on a damp, clean coat and combed through or rubbed into the coat before drying. This is a silicone rinse that is a polish to protect the coat, giving it a wonderful shine, and it repels dirt, too. You do not want to use a creme rinse on a Corgi's coat. That's a no-no that leaves the coat way too soft to the touch as the outer coat is to be harsher in texture. A block of French white grooming chalk, plus loose grooming powder (harsh coat) is also needed for the final touches before your dog enters the ring. A toothbrush or a fingernail brush and a round tin to hold the chalk is also needed. Plus a small natural or nylon bristle brush is needed to brush out the chalk. A jar of "Chalk Mate" creme (bought from a dog show vendor) or a tube of Kolesteral (found in the hair care section at the drug store) is also needed. If you have a black dog that stays out in the yard a lot, you will want to get a mink oil with sunscreen that you can spray on him daily, before he goes out in the sun. I have also occasionally had to put a Corgi "in oil" if his coat was in terrible shape when I got him. This is for extreme cases, or if a dog is extremely difficult to keep in coat. I use Biogroom's Super Cream, a small amount straight out of the jar, rubbed thoroughly into each area of the coat. If you use either of these you must be sure they are washed out completely before showing the dog, as they really make the coat appear oily. A few towels, a couple of spray bottles, a small bucket and a washcloth or two completes your grooming box. A week before you go to the show, you want to assess your dog, and make sure that his teeth are clean, his toenails are short and he is clean. You may need to give him a bath, or you may need to just bathe his "white parts." If you have a dog with a cowlick in his topline or in another area, then you don't want to bathe that part unless it is absolutely necessary. If you have combed him out on a daily basis then you should only have to quickly comb him out before you bathe him. After his bath, blow him dry while combing him out. If he is blowing coat, comb him out first with a coarse comb, to loosen the dead coat. Then recomb with the medium tooth comb, and finally with the fine tooth comb. The flea comb is usually only used as a final touchup before going into the ring. To comb the dog, always go in the direction the coat grows or at a right angle to the growth. We rarely back brush (go in the opposite direction of hair growth) on a Corgi. I usually start with the dog lying on his side, either on a grooming table, or on my lap. If you do not have a table, it is often easiest to sit on the floor with your legs out in front of you. Lay the dog in the "V" between your outstretched legs on his side. Start at the back of the dog on the hind leg. Comb the hair from the hock down to the toes. Then in the longer hair on the broad part of the thighs, separate the coat, holding it up with your left thumb (if you are right handed) and then comb a section of hair down toward the foot. This will be at a right angle to the direction of growth of the hair. Continue combing until you have reached the top of the thigh where the topline coat begins. Then comb the "pants" section, starting at the area right above the hock where the hair becomes longer to form the pants. Again, hold the hair up with your left thumb, and separating a small section at the time, comb it out and down towards the hock. Then comb the sides of the dog, starting in the loin area in front of the thigh, and using the same technique, comb in sections until you reach the ruff area of the neck. Turn the dog over and repeat on the other side. Then lay the dog on his stomach, and comb his topline, starting at the tail area, with the dog facing away from you, and work your way up toward his neck. Then with the dog seated in front of you, start at the bottom of the chest and use the same technique that you used on his legs and sides, comb up the chest and neck to right under the chin. Comb the coat on the legs, too. Then work around the sides of the neck in small sections in the longer hair of the ruff. Finally, comb the face, the top of the skull and the cars. (Yes, even comb the ears!) If you do this on a daily basis, it should take no more than 10 minutes, as the comb glides easily through the coat. I usually use the fme comb to do the daily grooming. You will find that your dog looks forward to his daily grooming session. This is a good time to quickly brush his teeth and check his nails. You will also be surprised how quickly you can pick up on any small changes in your dog's health in your daily sessions. I have caught things that were easily cared for which could have become a serious illness if not noticed right away. Now, on the day of the show, you should get to the show grounds in plenty of time to exercise your dog and have at least 30 minutes before his scheduled show time in which to put on the finishing touches before his ring appearance. Put him on the grooming table and comb him thoroughly, first using a fine comb, and then repeat with a flea comb. When that is done, check his feet and see if you need to do any trimming underneath or around the outside of the foot to tidy him up. Let me stress that this is the only trimming other than whiskers that is allowed on a Corgi. This is a natural breed, and if you want something you have to sculpt and shape, get a poodle and leave Corgis alone! You can, by trimming the sides and leaving the hair above and immediately around the toenails longer, make a rounder foot look more oval. Try not to trim so much hair that you make the proper oval foot look round! Next, using a spray bottle full of the "purple stuff" (non-rinsing shampoo) spray his feet and any areas of his body that have gotten dirty. Work the purple stuff in thoroughly with your hands. If he has really gotten his body coat dusty or dirty, then pour a little of the purple stuff into a small bucket (those stainless steel water buckets are perfect) and fill about halfway with water. Using a washcloth, soak it in the solution, and wring out excess. Rub this into the dirty coat area, resoaking cloth in solution as necessary. If he is really a mess, you may need to completely change the solution a couple of times, but don't give up, it will come clean eventually. With a dry towel, rub his white legs to remove as much of the waterless shampoo as possible. You can get him pretty dry by doing this. Do the same to any areas of his body coat that you have either sprayed or on which you used the washcloth method. If your dog is slightly out of coat, you may wish to work a little foam coat dressing into his coat to help hold it up a little, but usually, water works just as well, as long as you don't overdo it. Now, if he has a stubborn cowlick to a part of his topline, you may want to comb the topline flat, and lay a folded towel across the offending area while you work on chalking his feet. Before chalking, it is best to put a towel down on the top of your grooming table to prevent the chalk from grinding in the surface. With the legs only slightly damp, place a dime to nickel sized dollop of chalkmate or kolesteral in the palm of your hand. Rub your hands together lightly to distribute the creme, and then apply to your dog's foot and leg going against the growth of the coat, from the toes up the leg. I usually just pick the leg up and wrap my hand around the bone of the leg and rub up. Do both front legs, then repeat for the back legs. Now, open the tin of chalk and place the lid under the leg you plan to chalk first. Using either a toothbrush or a people nail-cleaning brush (I prefer the one with the curved handles, it's easier for me to grip) dip your brush into the chalk, getting as much chalk on your brush as you can. Then work the chalk into a small area of your dog's foot, and working a small section at the time, continue up his leg until his white coat ends. Repeat for all four feet and legs. I very rarely chalk the white chest or neck areas, only if they have become stained, then chalking will help temporarily whiten them. The chalk not only whitens, it adds body to the coat and helps to accentuate the bone of a dog's leg. You may wish to trim his whiskers, but the majority of breeders do not. As a judge, I really don't even notice if they have been removed, and I really prefer the Corgi with his whiskers left intact. If it is not yet time to show, put your dog back in his crate until you are ready to go to ringside. Before going to the ring, put your dog back on the table, and with the natural bristle brush, brush out all of the loose chalk. Be sure you get it all out, or the judge is within his rights to dismiss you and your dog from the ring for having a foreign substance in his coat. If you left too much water in his coat, and the chalk looks clumpy, by using the Force Air Dryer you can blow the chalk out while drying the coat at the same time. If your dog has a white muzzle, and there is a pink spot where his nose joins the top of his muzzle, you may take the chalk block and lightly rub the area to blend the pink into the whiter muzzle. Don't wipe this off, just gently blow off the looser particles of chalk. You may wish to lightly spray the chest and neck area and the pants of the Corgi with water. You should comb the back of the neck down, towards the back to accentuate the length of neck, while fluffing the chest coat up. If your dog is a little long in hock, comb the hair on his hocks up from the foot toward the point of the hock either with a flea comb or a slicker brush right before you take him into the ring. This will give the illusion of shorter hocks. Comb the pants out straight behind the dog to give maximum width to the thigh. By the time you get to the ring the hair should look just right. If your dog has a dip in his topline, you may lightly spray with water and back comb just that area. By the time he has walked into the ring it will settle a little and not seem too obvious. You must be very careful when in the ring, not to continuously bring attention to one area of your dog - such as back brushing the topline, as you will just be pointing out to the judge where you think your dog is faulty. When your dog walks into the ring, he should glow from the inside out! A dog cannot be put into show condition on the day of the show. Grooming him for the show should begin in puppyhood, or if you are the breeder, in the womb! He should be kept parasite free, eat a top quality dog food, and be groomed on a regular basis. If he is clean and healthy, we can only add finishing touches. This is a natural breed, and one of the Corgi's great attractions is the fact that he is so easy to keep with a minimum of grooming whether at home or in the show ring. Copyright, 1997, Stephanie Seabrook Hedgepath. All rights reserved. Reprinted with permission.